See our page Harry's Memorial Park which details latest progress & developments. 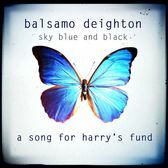 "Sky Blue and Black", originally a Jackson Browne track has been recorded especially by balsamo deighton with all proceeds going to Harry's Fund. Balsamo Deighton also performed at our Charity event March 2012. 100% proceeds go to Harrys Fund. Multiply our resources by letting others know about our fund and the help we need. Simply tell people or via Facebook.